Last month saw the release of Disney’s live action re-make of the well-loved classic, The Jungle Book. Directed by Jon Favreau, the much-anticipated film has enjoyed tremendous early success in both the UK and America, topping the box office charts and breaking ticket-sales records. This modern twist on Rudyard Kipling’s iconic tale, is not only thoroughly entertaining, but also demonstrates some of the main themes explored by animal geographers, as well as those that Bear (2011) (yes, his name really is that apt!) has identified as being under-developed within the discipline. The most prominent theme that runs throughout the film is the oft-debated, long-standing human-animal binary, placing nature in opposition to culture. Physically, the humans and animals are separated, the human village being distinct from the rest of the jungle. Each have their own place, geographically defined, keeping them separate rather than in constant competition for survival. The cognitive difference between humans and animals is much more heavily emphasised throughout the film. Man’s capacity for rational thought is widely cited as the main distinguishing feature between humans and animals. Let’s start with “man’s red flower”, the phrase used by the animals to describe ‘fire’. The ‘red flower’ stands for man’s superior intelligence and more civilised state; only humans know the secret of how to make it, and its devastating effects are feared by the animals, reinforcing human control over the jungle. Even King Louie, King of the Apes and “jungle V.I.P.”, is aware of the power this ability gives man. As he sings “I wanna be like you”, we are reminded, yet again, of the abyss that remains between man and beast, not only because he “desires man’s red fire”, but also because he wants to “walk like” and “talk like” humans too. Mowgli’s character also serves to remind us of human-animal difference. His presence in the jungle, a boy living with the wolf pack, turns heads amongst the animals; he is, as geographers would put it, ‘out of place’. Even the wolves who raised Mowgli, and his trusty panther friend Bagheera, scorn some of his innately human ways of problem-solving, which they call ‘tricks’. Mowgli’s presence where he does not ‘belong’ is the reason that he becomes hunted by Shere Khan, and driven out of the jungle by the tiger. On his journey to the man village, Mowgli meets arguably the most loved animal in this story, Baloo the bear, who, after rescuing him from death by python (Kaa, to be precise), soon develops a close bond with him. Mowgli’s distinctly ‘human’ traits are further emphasised, Baloo exploiting his ‘tricks’ in order to help him harvest honey using a complex system of pulleys that only a man could make. After learning that Shere Khan was responsible for his father’s death, and that the tiger has also killed Akela, the leader of the wolf pack, taking charge of the jungle, Mowgli returns to confront Shere Kahn. Taking a burning branch with him from the man village, Mowgli pursues Shere Khan in order to save his wolf family and the rest of the jungle animals from his tyrannous reign. However, his act only further reinforces man’s superiority, as he inadvertently sets fire to the jungle, the fear in the animals’ eyes being a very poignant reminder that Mowgli is, despite his upbringing, a human. Even though, by slaying Shere Khan he helps the other animals, the film still emphasises that man – in this case, Mowgli – and animals are habitually in conflict, a conflict that is often resolved through hunting, slaughter, and the expression of human superiority. Whilst Mowgli’s character creates a clear division between humans and animals, he also serves to blur the distinction, something which animal geographers argue is becoming more and more common. Being raised by wolves, Mowgli grows up to be one of the pack. He develops wolf-like behavioural traits and, as animal geographers would call it, undergoes a process of ‘becoming wolf’ through close cohabitation. This Deleuzian notion of ‘becoming’ is one which animal geographers have explored in order to explain close human-animal relationships that transcend the boundaries of ‘man’ and ‘beast’. 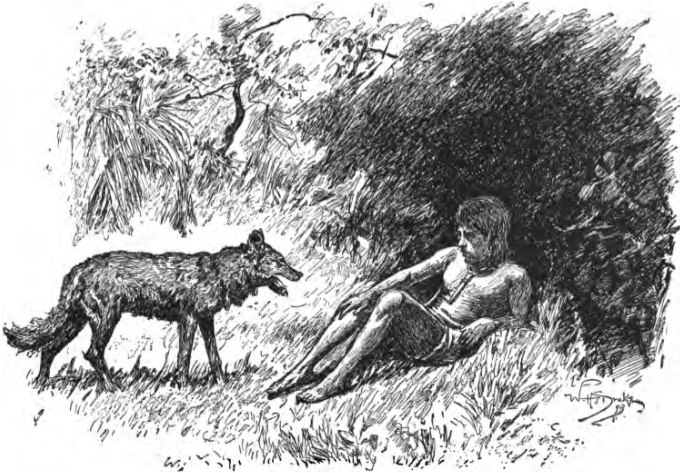 Even the language used by the animals to describe Mowgli – ‘man cub’ – shows the ambiguous nature of his character, not quite man, but not quite wolf. Through living with the animals Mowgli learns to be sensitive to their needs, and develops a close understanding that animal geographers, such as Bear (2011), argue is so difficult to achieve. Finally, The Jungle Book, also provides an insight into, what animal geographers argue, is an under-developed theme in animal geography, the individuality of animals. Bear (2011) stresses that most animal geography studies focus on groups of animals or whole species, rather than the individual. In his study of Angelica the octopus and her affective relationships with visitors to her aquarium, he poses that more can be learnt about human-animal relationships by studying individual animals, studies of groups of animals homogenising and concealing the individual. In The Jungle Book, whilst we still have groups of animals – such as the pack of wolves and the almost mythical herd of elephants – there are many characters who tell their own individual stories. 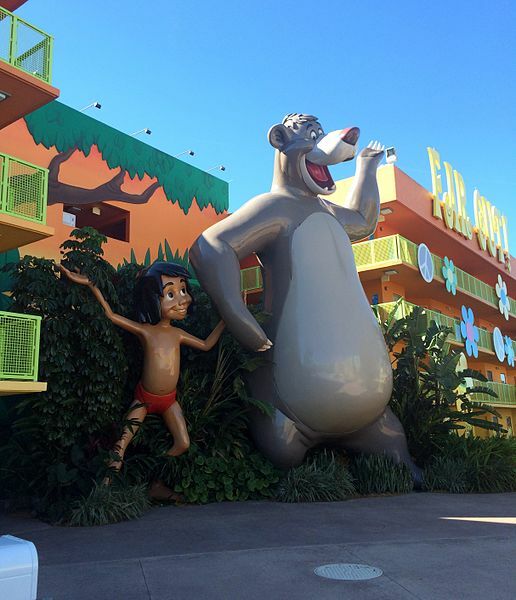 Baloo the bear, Bagheera the panther, Shere Khan the tiger, and King Louie the gigantopithecus, each express their individuality and have different relationships with Mowgli and the other animals. This, in turn, affects the audience’s response to them; Baloo appears comical yet kind, Bagheera is brave and loyal, Shere Khan is cruel yet vulnerable, and King Louie is powerful and greedy. Interpret them as you will, but, whilst fictional and highly anthropomorphised, it is through these individual stories that the audience form an understanding of the human-animal relationships at play in the film. Both as a thrilling piece of cinema, and as a demonstration of animal geography’s wider relevance, The Jungle Book is well-worth a watch! Bear, C. (2011) “Being Angelica? 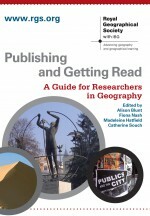 Exploring individual animal geographies”, Area, 43(3):297-304. This entry was posted in Area and tagged animal geography, Animal individuality, Becoming, Deleuze, Human superiority, Human-animal relationships, The Jungle Book on May 9, 2016 by k8amongthepigeons. Surrogacy – the term brings to mind stories from the yellow press. Images of celebrities such as Nicole Kidman, Sarah Jessica Parker, Elton John and Ricky Martin who smile into the camera with their cute babies. They have all become parents thanks to surrogate mothers. While media focus on the individual stories of joy or drama surrounding surrogacy, we know very little about the networks of people, technology, money, and infrastructure that make reproduction work at a distance in transnational surrogacy markets. In short, what holds the market of surrogacy together and why does it fall apart? Based on Carolin Schurr’s long term ethnographic research on the surrogacy industry, our paper ‘Assemblage thinking and actor-network theory: conjunctions, disjunctions, cross-fertilisations’, published in Transactions of the Institute of British Geographers, engages with this question. The paper argues that bringing assemblage thinking and actor-network theory (ANT) into dialogue offers novel ways to understand how (surrogacy) markets are assembled across space and why the complex networks of human and non-human actors constituting (surrogacy) markets may fall apart, only to reassemble in new ways. Suggesting three cross-fertilizations between assemblage thinking and actor-network theory, the paper exemplifies along the empirical case study of the transnational surrogacy market how geographers’ work can benefit from differentiating between the two approaches more carefully and thinking systematically in what ways they complement each other. First, we argue that the empirical toolbox of ANT helps explain how the socio-technical networks of surrogacy markets are stabilized. Or in other words, how surrogacy agencies such as ‘My Baby’ manage that Manuel and Rodrigo from Spain, who want a baby and have the money, meet the oocyte of Anita – an egg donor in Sweden –, the womb of Benita – a young mother of two from Chiapas – and Dr. José in Cancún – whose clinic is equipped with the state-of-the-art medical technology from the United States. But not only do they need to meet, they need to meet at the right time, under the right circumstances. But how does ‘My Baby’ manage to control this global enterprise? It manages to govern at a distance by enrolling the necessary elements in relations and holding them stable for a while with the help of technological devices that facilitate the control and surveillance of the different actors involved. Second, the paper shows that ANT has increasingly embraced multiplicities and fluidities – central to assemblage thinking – as constitutive elements characterising networks. Surrogacy agencies such as ‘My Baby’ could not survive in the constantly changing legal landscape without network fluidity. ‘My Baby’ foresaw the dramatic changes in India’s surrogacy business when the government passed a new bill in 2012 that restricted surrogacy to heterosexual, married couples. Opening up a new branch in Thailand just in time made it possible for them to continue to respond to the demand of their gay clientele. When the military government in Thailand shut down surrogacy businesses after the Baby Gammy scandal, ‘My Baby’ had just set up a new fertility clinic and surrogacy agency in Mexico (Fig. 2) that has since turned into the latest hotspot for gay surrogacy. The final outcome – the baby – needs to be held constant, but the associations that bring it about have shifted all the time. Third, we suggest that ANT can benefit from the attention to affect in bringing socio-material relations into being, which is so central in assemblage thinking. The role of desire is key here. Deleuze and Guattari understand it as much more than an individualised feeling of wanting to have something. For them, desire is the distributed production of wishes in an arrangement of humans and things. So it is not only the intended parents’ desire for a baby that is central for the global assisted reproduction assemblage to emerge. This assemblage is produced as much by the hetero-normative imperative of the ‘happy family’ that pervades most societies as it is by the pictures that agencies such as ‘My Baby’ and clinics use to visualize the ‘little prince’ as the crowning glory at the end of parents’ travails (Fig. 3). The desire for profit is the key rationale for agencies and clinics to become enrolled in the assemblage. The desire for wealth and a better life for themselves and their children enroll egg donors and surrogate mothers. In short, desire, in multiple forms, is the central force binding the human and non-human elements of surrogacy together: intended parents, egg donors, surrogates, IVF professionals, airplanes, time schedules, petri-dishes, hormonal drugs and so on. For geographers engaged in empirical work, a cross-fertilisation between ANT and assemblage thinking offers the best of both worlds. It brings the tried-and-tested ANT toolbox of concepts to the study of the emergence of order and disorder in a more-than-human world. It sharpens our sense of different kinds of change in socio-material relations that is central to the new fragile markets of bodily commodification. And it does so in a mode that is attentive to the distributed, bodily capacities of humans and non-humans alike. The price we need to pay for this is a small one, we think. Just as transnational surrogacy markets have challenged the national boundaries of traditional forms of kinship and family-making, cross-fertilizing ANT and assemblage thinking challenges us to leave behind some cherished certainties as we abandon the safe territories of our conceptual homelands. Carolin Schurr is Assistant Professor of Transcultural Studies at the University of St Gallen, Switzerland and Martin Müller is Swiss National Science Foundation Professor at the University of Zurich. This entry was posted in Transactions of the Institute of British Geographers and tagged Actor-Network Theory, affect, assemblages, Deleuze, desire, Latour on March 21, 2016 by RGS-IBG Managing Editor: Academic Publications.